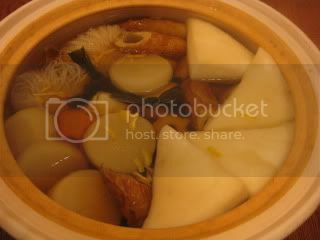 Oden is such a popular stew/ hot pot dish, especially in the winter time in Japan. There are also many restaurants as well as street vendors which specialize in this national dish. While there are different variations by region, typical oden is basically vegetables and fish cakes cooked in a clear soy-based broth. 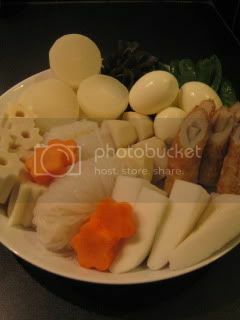 Here's my home-style oden ingredients: daikon, boiled eggs, konnyaku shirataki (yam jelly noodle), chikuwabu (tube-shaped flour dumplings), kombu, sato-imo (taro), chikuwa gobo (burdock-root stuffed fish cake), hanpen (fluffy white fish cake), etc. To make oden, whether it's for 2 people or 6 people, I find it becomes tastier when I cook a larger batch. 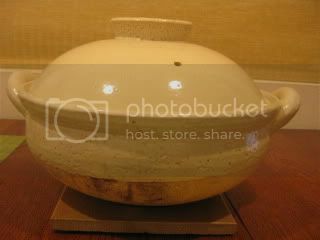 So, I used my largest donabe, which is donabe steamer, "Mushi Nabe" (without the steam insert), for this dish. Those ingredients which requires longer time to cook were added to the broth first. Later, all the ingredients were added to the donabe. Oden was served at the table right out of the donabe. 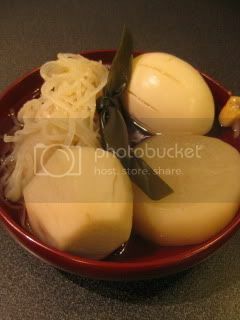 The typical condiment for oden is karashi (Japanese hot mustard). Everything was so tasty. 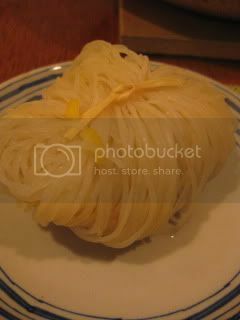 Konnyaku shirataki (yam noodles) were cut in half at the time of the service. Just wonderful. 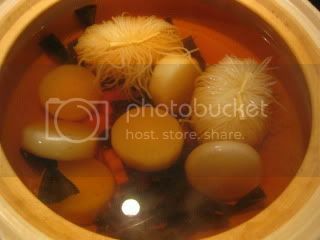 My all-time favorite oden ingredients (I have two) are chikuwabu (tubed flour dumplings) and kombu. 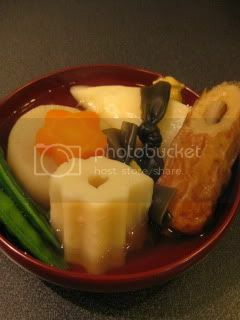 When I was little, when my mom made oden at home, I always ate so much of chikuwabu and kombu. So, she had to cook extra amount of these items.